Parenting is not easy – there’s no training, not enough support, and it can be hugely challenging. Join a group of like-minded parents led by experienced Hand in Hand Instructor Madeleine Winter. Have your questions answered, build your support network and be encouraged as you build closeness and connection in your family and learn to set loving limits. reflect on our own stories and how these influence our parenting. In a Hand in Hand Parenting Support Call or Group, you can learn about how Hand in Hand Parenting can work in your family, share experiences of using the Listening Tools at home, and have questions answered. In each meeting we will often practise a short Listening Partnership in pairs, and each parent is listened to in turn by the group, in a confidential environment, without comment, judgement or advice. Being part of a Support Call or Group can help you develop a support network which you can use to help solve your parenting challenges. Getting a chance to be listened to in this way can often turn your day around, and over time, improves your capacity to connect with your children, and your flexibility in responding to their difficulties. Groups are limited to six participants, generally meet for four-to-eight sessions, either via phone based conference call or in person. The length of time we meet will depend on how many people join the group, but it is usually 1.5 hours. Why get together with other parents? What happens on a Parent Support Call? How can I join a Call? Where are they held? How big are the groups and how long to they run? Tell me more about Parenting Consultations. What have other parents said about these groups? Parenting is not something we were ever meant to do alone. I’ve not met a more admirable group of people than parents. From the depths of our love for our children, we will do almost anything to have things go well for our children. But it’s hard: we are not well supported, and we often end up feeling it is “all our fault” and struggling with feelings of exhaustion, guilt, isolation, and worry. Sometimes we end up feeling we con’t care that much. Something very special can happen when we get together with other parents, especially where we know we will not be judged or criticised, we will not receive unwanted advice, and where the stories we need to tell are kept confidential. We are reminded that we are not alone, and that there are good reasons why it is hard, and we see the value of the work we do as parents. We learn from one another, and we build networks of support for the emotional work of parenting. Being part of a Support Call or Group can help you develop a support network which you can use to help solve your parenting challenges. In a Support Call, each parent has time to be listened to without interruption or advice giving, about their particular parenting challenges (or victories!). Getting a chance to be listened to in this way can often turn your day around, and over time, improves your capacity to connect with your children, and your flexibility in responding to their difficulties. 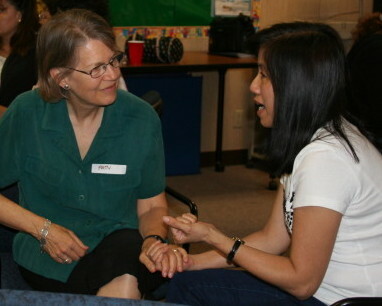 Many parents will also build ongoing Listening Partnerships with other parents in the group. The calls are led by me, an experienced Hand in Hand Parenting Instructor and parent of a teen. I will provide mentoring and guidance as you try the Listening Tools in your family and share your experiences with the other parents on the call. How do I join a Support Call? Where do they happen? We use Zoom conferencing for our Support Calls, and we will send you dial-in details once you have registered. You can join with vision via an app on your phone, via your web browser, of just dial into a local number. In-Person groups are held in Sydney, Australia. brief introductions – what is going well in your family? introduce and review the Hand in Hand Listening Tools as necessary. each parent is listened to in turn in the group, in a confidential environment, without comment, judgement or advice. Who can attend? Do I need to know anything about Hand in Hand Parenting? These groups are open to all parents. It helps if you have some familiarity with the Hand in Hand/Parenting by Connection approach. If you are new to Hand in Hand, I recommend booking a Personalised Parenting Consultation where we can develop a Parenting Connection Plan, tailored to the needs of your family. You can then revisit this in the Support Calls. I offer these Consultations at a discounted rate if you join a Group or Support Call. These groups are open to parents of children aged 0-12. It is preferable if you have some familiarity with the Hand in Hand/Parenting by Connection approach. For a good general introduction you can learn about the hand in hand approach. For a more in-depth introduction, we can highly recommend the Short Online Parenting Courses on common parenting topics. If you are not sure, please contact Madeleine to discuss. I am offering an hour long One-on-One consultation at 30% off the regular price if you sign up for these Support Calls. This gives us the opportunity to get started straight away with understanding the challenges and strengths in your family. If you are new to Hand in Hand, I can introduce the approach tailored specifically for your parenting situation. If you are familiar, then we can dive more deeply into developing a Personalised Parenting Connection Plan for your family, to solve problems and help you build connection and closeness. You will then be able to use the Support Calls to follow up on that plan and have your questions answered as you implement it. You can book a consultation when you pay for the Support Calls. I’m an experienced Hand in Hand Instructor, and I provide mentoring and guidance as you try the Listening Tools in your family and share your experiences with the other parents on the call. You can learn more about me here. Want to get a sense of me? Listen here to me talking about how to stay close to your teen, and Solving Separation Anxiety. Mother of 2 year old, Austin, TX USA. © 2018 by Madeleine Winter.